Riley Culley (center) poses with his parents before a fundraising “Run for Riley” event which teammates and the community put together to help the family with medical costs for Riley’s cancer treatments. The path that South Jordan’s Riley Culley had mapped out for himself took an unexpected detour last March when the Bingham High all-state offensive lineman’s lower back pain led to a diagnosis of Ewings’ Sarcoma. A football scholarship to Dixie State University in the fall was suddenly on hold and the least of his or his family’s concerns or priorities. Culley was now facing months of chemotherapy and radiation to fight this cancer. “My first thought was, ‘What do I do now? How do I beat this?’” he said. Riley Culley (on far right) poses with his younger brother, Levi, who shaved his head to share hairstyles during Riley’s battle with cancer. Riley’s mom Jackie is on the left. When the Culleys were confronted with the reality of Riley’s situation, Jackie said her initial gut feeling wasn’t one of panic. 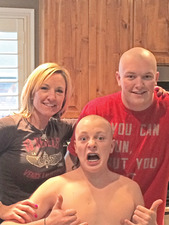 So, Riley used the lessons he learned on the football field as a two-time all-state center to tackle cancer. “Riley was a great leader in our program,” recently-retired Bingham head football coach Dave Peck said. 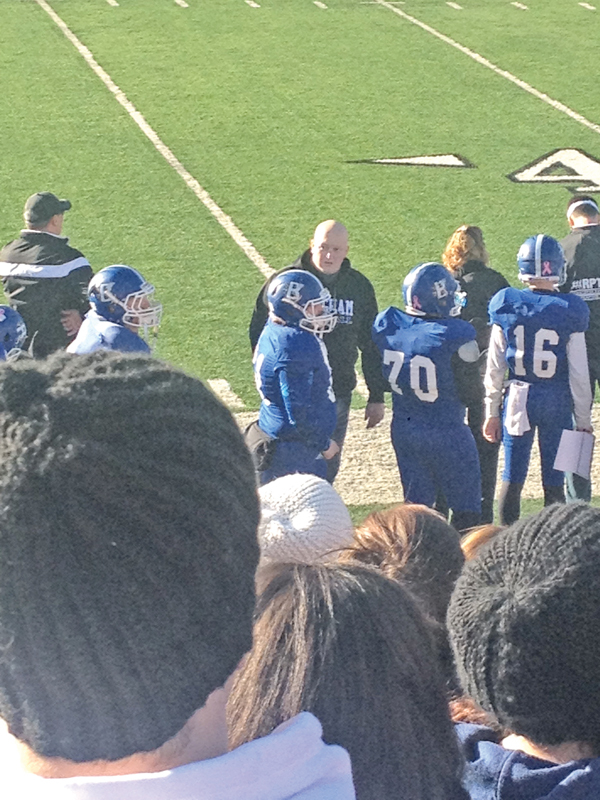 Former Bingham High football player Riley Culley helped coach the Miners offensive line this past season. With those teammates, the community and his family rallying around him, Riley went through months of chemotherapy and radiation while experiencing a range of emotions from positivity, anger and resentment to happiness and laughter. This past football season, Riley helped coach Bingham’s offensive line and even traveled with the team to play Bishop Gorman (Nev.) and in the State Champions Bowl Series in Florida. Riley was able to “ring the bell” at Primary Children’s Hospital in mid-January signaling the end of his treatments. His port was removed Feb. 6. Riley credits his grandpa Jay Culley, who passed away from bladder cancer during his senior year, for much of the strength he received throughout this past year. Trying to “pick up where I left off,” Riley is back in the gym working out as his daily stamina allows and is also working part-time at a gym while he again prepares to go play college football, the dream he was sidetracked from nearly a year ago. Riley hopes to reach out and inspire others who are facing cancer or other challenges that have taken their life down a different road.